I hope somebody can help me get started with my first Raspberry project.. It seems doable except this is my first project and I do have sufficient programming / computer skills but no electrical knowledge. I moved to an other house 6 months ago and I have some people helping me in the house and garden. They all come in through the big automated port at my home. The board which controls the port has a TLS contact which means in English it’s contact dry contact. Everytime the port opens it gives a pulse (can be set anywhere from 1 sec till 240 sec). I want to log this pulse. The question is how I can connect the Raspberry PI to my board ? Can I connect it directly to the GPIO pins or do I need some sort of circuit ? About the software part I don't worry, but as I said I don't know where to start with the hardware part. Okay so, i've only just realized i should have asked what model of pi you are using. 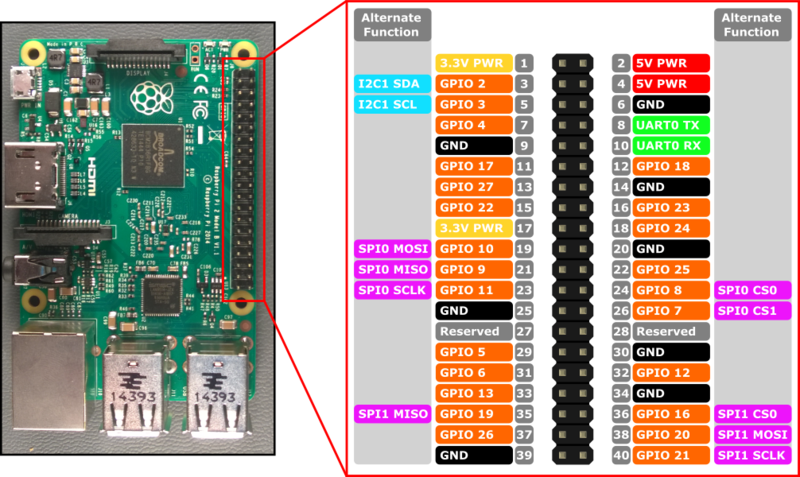 I've already drawn this out with reference to rpi2/rpi3 pins layout, however if you are using a different model it should be pretty easy for you to change the connections accordingly. For reference, here is the pin layout for this model https://docs.microsoft.com/en-us/windows/iot-core/media/pinmappingsrpi/rp2_pinout.png. Notice that in this example i'm using GPIO 18, but you could use any GPIO, and set it up as an input programmatically. Also you should set this GPIO with an initial internal pull-down resistor, so that it's not floating when the dry contact is open. You can do this pretty easily programmatically, let me know if you need any help on this too. So to wrap it up, when the dry switch is open you should see a LOW input at the GPIO, and when is closed, you should see 3.3V, hence HIGH at the GPIO. It would appear the answer given in that diagram is wrong. The 10k resistor should be from the 3.3V rail to the GPIO pin. It is called a pull up resistor and it ensures the GPIO pin sits at 3.3V (logic 1) when the switch is not operated. 10k is just a common value which gives a sufficiently solid pull up without drawing excessive current when the switch closes. When the switch closes, it pulls the GPIO pin to GND (0 logic) and draws current through the 10k resistor. Not the answer you're looking for? Browse other questions tagged gpio hardware or ask your own question. IR Door Security Project - Where to start? Monitor/Debug SPI using another GPIO Pin?